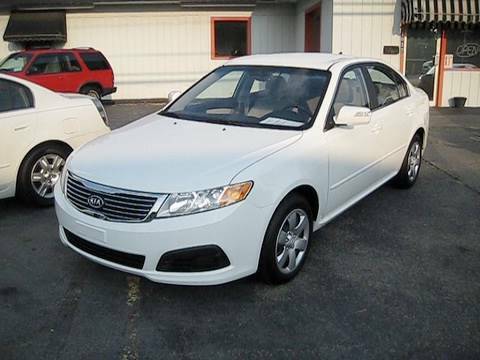 If you're looking for a four-door sedan with responsive driving characteristics, a lot of features and an attractive price, the 2010 Kia Optima should be on your shopping list. It's handsome, offers impressive safety features and represents a good value for the money. Turn signal lights on the outside of car are on the rear view mirrors. We have a Kia Optima. It is 9 years old and has given us quite a few problems through these 9 years. Most of the trouble has been with the headlights and with the interior lights. The headlights randomly got out. . . No apparent reason even though my husband just spent money to replace it with a new light. This has happened numerous times. We've had the interior lights stay on all night for again, no apparent reason and the next morning we get ready for work and bam! Our battery is dead! We've taken it to our local Kia dealer and they've kept our car for days, several different times all with the same verdict: they have no idea. Another challenge is now our drivers side car door will not lock or open without usually the key manually. It is also so with the drivers side back seat door. So, god forbid if I was alone at night walking through a parking lot and someone was following me I could not get in my car as fast as I could if the door unlocked with my automatic door opener on my set of keys. These problems have been on going. Definitely would not recommend a Kia at this point. The Kia Optima all in all. The Optima is a very comfortable ride. It has a nice look to it. The Optima gets good gas mileage driving in town and really good gas mileage on long distance drives. The Optima has quite a bit of space in seating and in truck for hauling for trips or shopping. The stereo system in the car is really good and balanced with good sound and surround. The air and heating runs really well and circulation is good in the car. One thing I do not like but is not really a big deal is there is no charging ports in the back for passengers to charge phones or electronics. All in all it has/ is a mechanically good car and has been very reliable for me. May have been a good car in its time, but not made for longevity. The car is good in that I put many miles on it, and it is currently at approximately 140, 000 miles and still going. I have many problems with it though. I cannot open the gas door unless I pop the trunk and pull the cord. My engine and airbag lights are on, my tire pressure light it on. I cannot unlock my door with the key. The remote only works some of the time, and even when it does not, it rarely unlocks all the doors, requiring me to go to the passenger's side and reach across to unlock my own door.